Four years ago, when the derelict Imperial 400 Motel on Bozeman’s West Main Street closed its doors, the community collectively breathed a sigh of relief. To many, the midcentury motor lodge had been blight on the city’s downtown. And to architects Brian Caldwell and Erik R. Nelson, the closure became a boon. The co-owners of ThinkTank Design Group took the opportunity to turn the Imperial into a retro boutique hotel. They named it The LARK, after Montana’s state bird, the Western meadowlark. 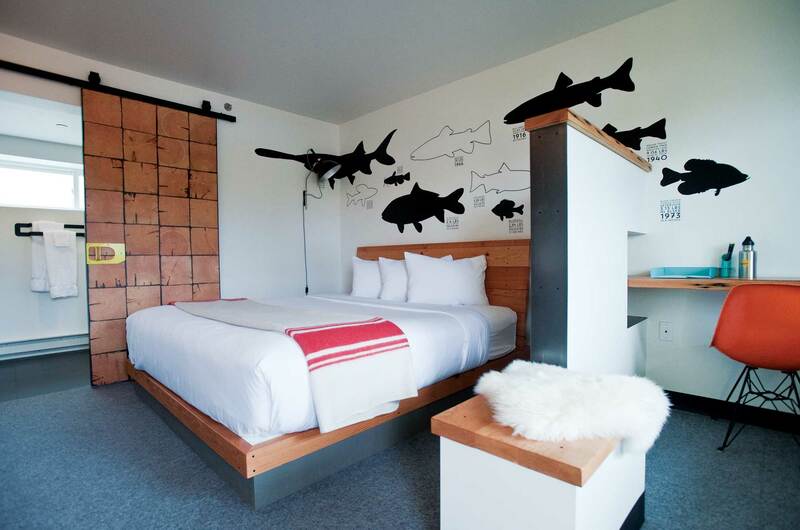 The LARK has since become one of Bozeman’s trendiest place to stay, an asset to the economy and spirit of downtown, and a model of imaginative city center revitalization. Now, ThinkTank is expanding their model, both onsite and at a location two blocks away. 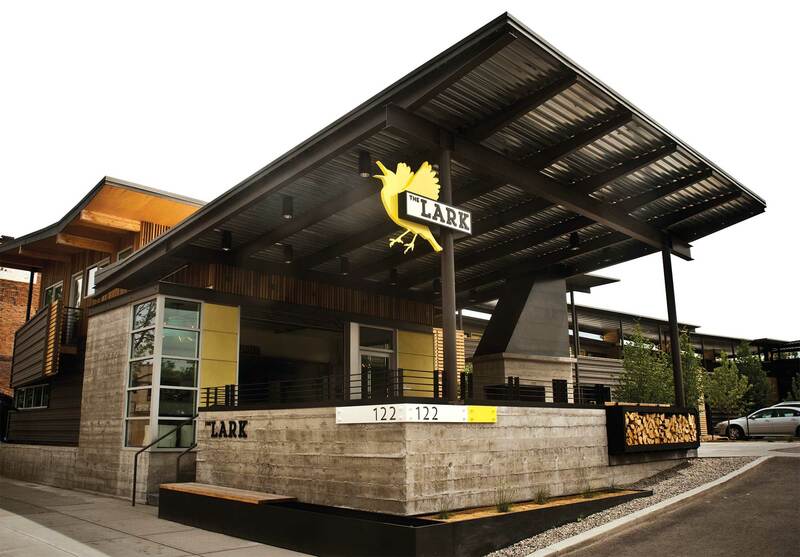 The LARK has a hipster vibe and minimalist, Modern aesthetic, albeit with a Montana twist. The ThinkTank team drew inspiration from disparate sources, including the Jupiter Hotel in Portland, the Ace Hotel chain, Hotel San Jose in Austin, and their business partner, architect Richard Fernau of Berkeley, California, and Clyde Park, Montana. They obsessed over every aspect of the project, from the bathroom tile to the pitch of the roof. The result is a cohesive design that coalesces into comfortable lodging. 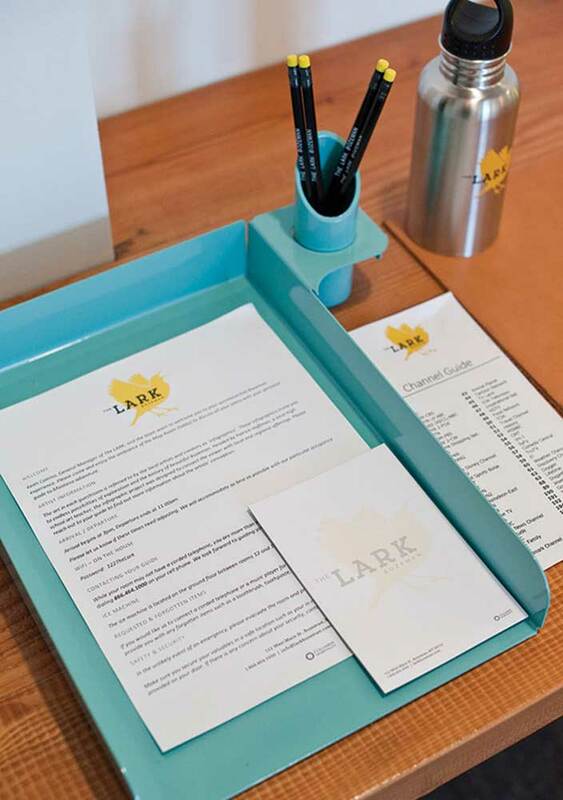 Upon checking into The LARK, guests receive a blank field journal the size of a passport containing the Wi-Fi code and front desk phone number. 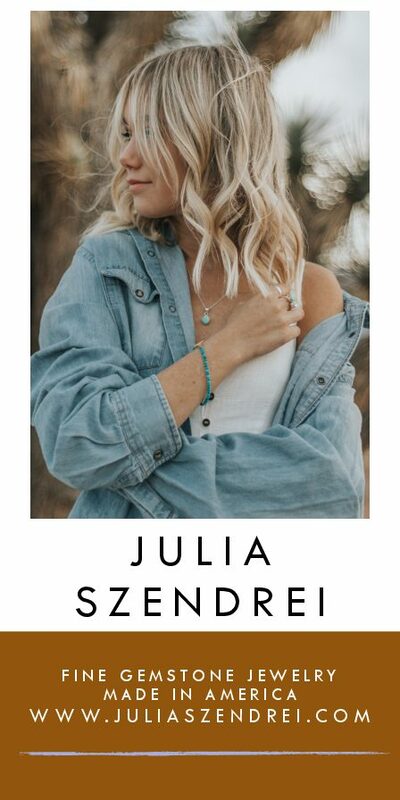 The journal symbolizes the hotel’s mission: to inform guests about experiences in Bozeman and beyond, and to act as a basecamp. 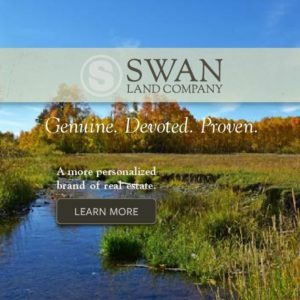 The business thus epitomizes the ethos of Bozeman, a town full of adventure enthusiasts who work in order to play, mostly outside. The motel’s clientele is of the same ilk: culturally informed yet outside the mainstream, seeking local hotspots but eager to get off the beaten path. Guests of The LARK can leave their rooms well-rested for their journeys. Beds are fitted with white, fluffy duvets, accented by red-stripped wool Dutch Navy blankets. The rooms feature built-in desks (perfect for one’s laptop), including LARK-emblazoned leather desk mats, pencils, and custom-built organizers. 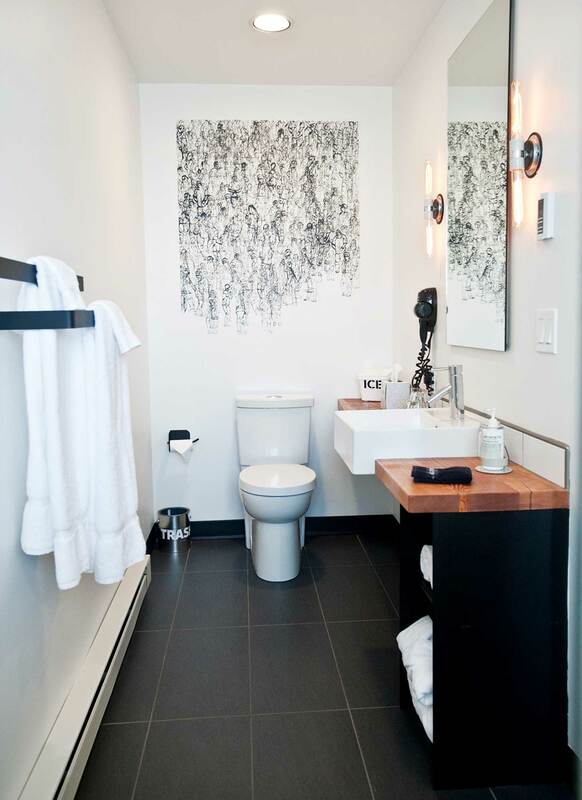 Bathrooms are chic and sunlit with subway tile and walk-in showers, stocked with MALIN+GOETZ products. 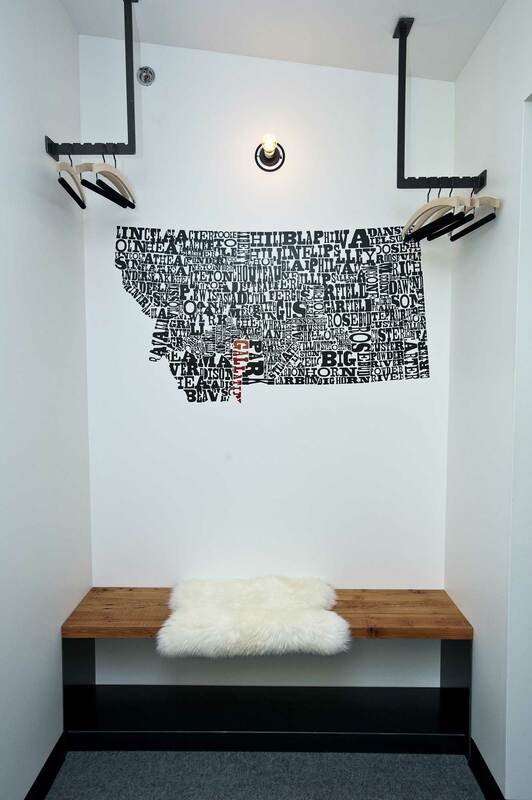 When ready to venture out, guests may visit the lobby’s map room, or glean inspiration from the wickedly cool infographics on the walls of their rooms. 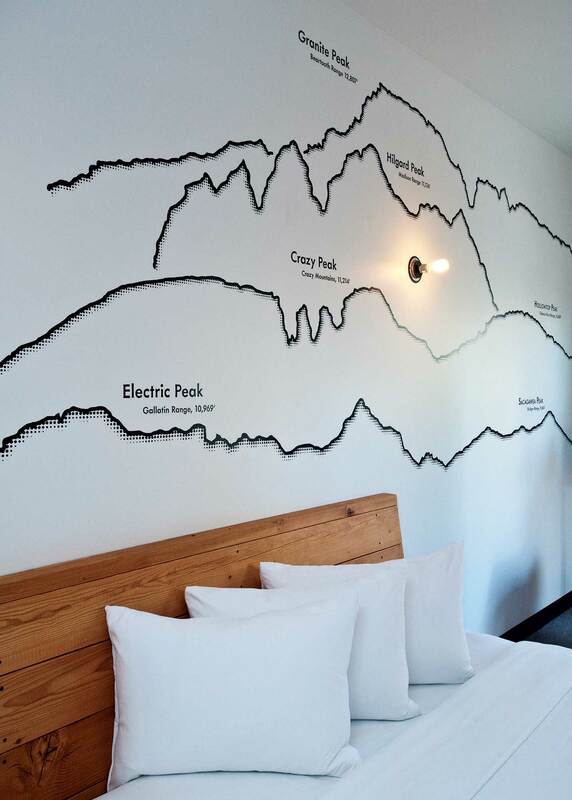 These artful diagrams, each created by a different local artist, depict Montana facts like annual snow pack, the wingspans of native birds, and destinations within walking, biking, driving, and “as-the-lark-flies” distances from the motel. Caldwell and Nelson did all the hotel’s interior design, working under the Modernist idea that utilitarian elements should be decorative as well as efficient. “Have fun with what you have to have,” said Caldwell, who sourced talent and materials locally. Pat Hoffman, for example, is a ceramic artist and high school art teacher who was The LARK’s artistic director. One of his contributions is an assemblage of slip-cast, wood-fired orbs attached by magnets to a wall-mounted steel plate in the lobby. The lobby is the epicenter of The LARK. 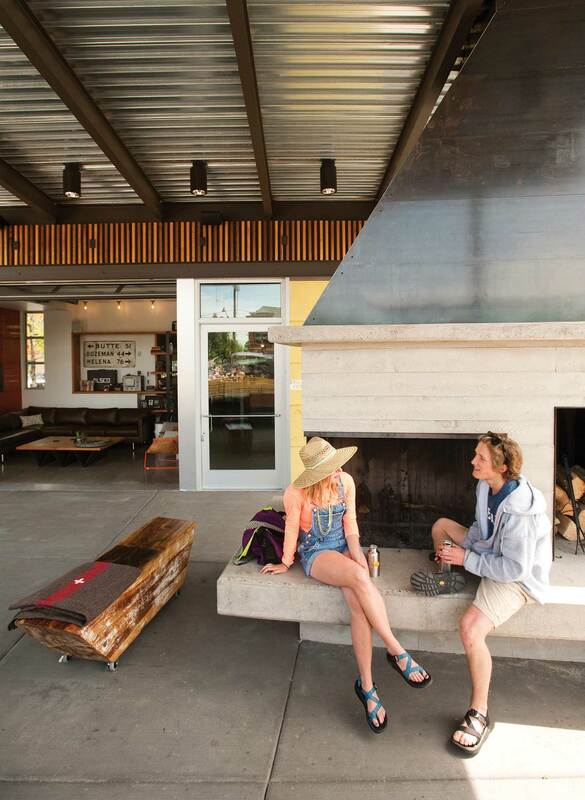 If it’s a nice day, the glass garage door will be open to the cement patio; there, guests sit by the outdoor fireplace and eat tacos and ice cream from Victory Taco, a food truck in a shining 1947 Spartan Manor trailer situated at the northern edge of the motor court. The LARK lacks its own restaurant, but offers locally-roasted Little Red Wagon coffee in the lobby. The patio was once a carport, and its transformation embodies the design challenges inherent in making a motor lodge pedestrian friendly. Another goal was to increase guest privacy. The ThinkTank team accomplished this by widening the balconies, effectively drawing attention away from guestroom windows. They cut the existing roof back then floated angular roof planes above it, thus letting air and light circulate. Exterior fin walls separate rooms into pairs, and landscaping now divides parking from the building. The latest design challenge facing ThinkTank is the expansion of The LARK at the western edge of the motor court. Construction will soon begin on a five-story building with 27 variably-sized rooms, a small penthouse conference room with 360-degree views, and ground floor retail space. “We are picking up on the themes of the existing building by incorporating interior and exterior corridors, and lot-side rooms that have access to the ground level,” said Nelson. The hotel will also offer valet parking. Even more exciting for locals is the news that ThinkTank purchased the 1910 Rialto Theater, two blocks away from The LARK at 10 W. Main St. The Rialto has been sitting vacant since 2006, to the detriment of Bozeman’s arts community. Nelson and Caldwell plan to make it into a flexible space suitable for both concerts with audiences of 300 and seated events for 120. It will serve both public and LARK purposes, and contain a beer and wine bar. 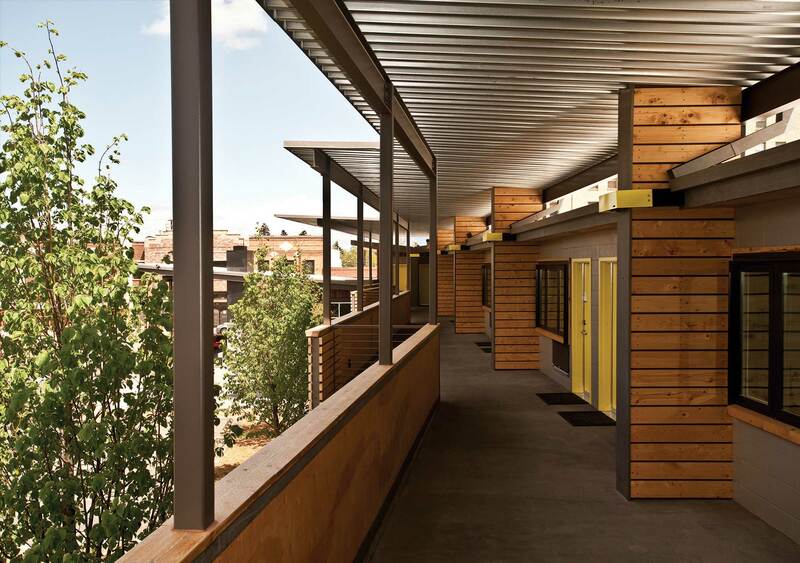 The LARK and Rialto projects are prime examples of the economic value inherent in imaginative city center revitalization, and creative repurposing of old buildings. The projects also represent the cultural value created by putting aesthetically- and historically-informed architectural knowledge to use, making spaces that benefit the arts and the public. 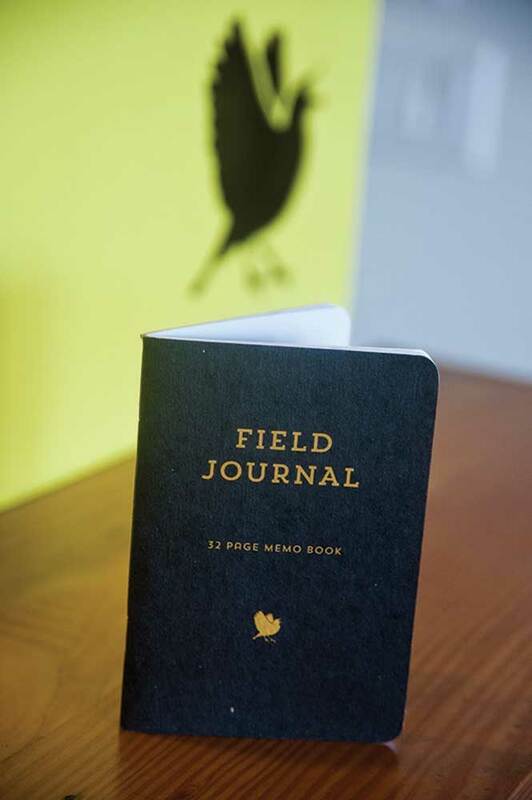 The LARK provides a field journal in which guests can record their Montana adventures. The lobby of The LARK is adorned with artwork by Patrick Hoffman and found objects gleaned by Montana picker David Perlstein and artist Ira Cuelho. 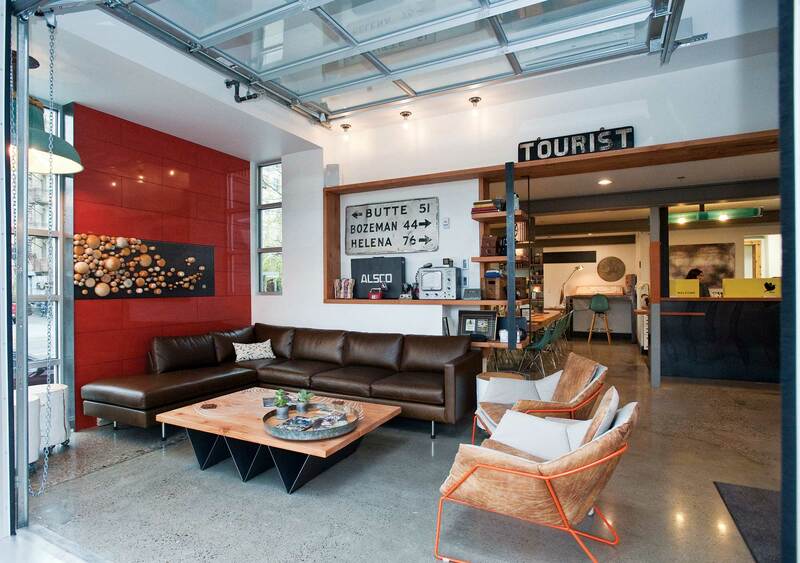 The patio more than doubles the lobby space when the garage door is open between the two. 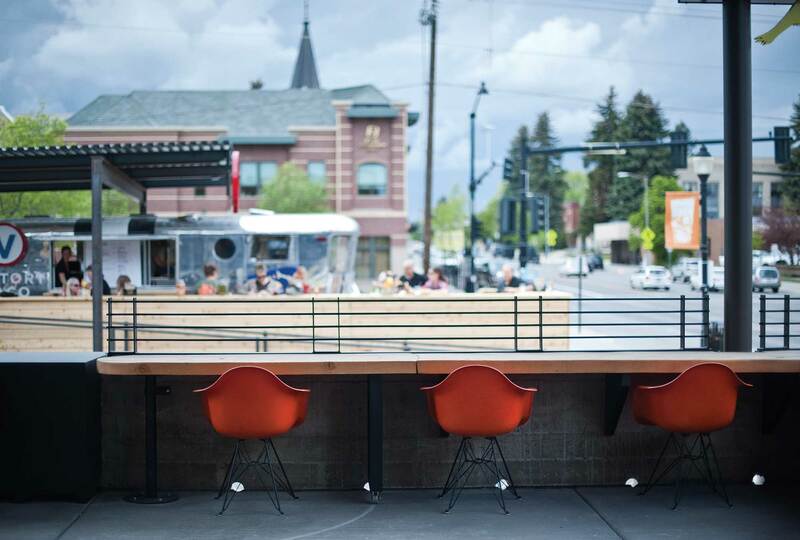 What once was a carport is now an elevated patio giving guests a perch from which to watch the Bozeman scene. Artist Sukha Worob’s original, hand-cast, rubberstamp artwork of human figures in various positions was applied directly to the bathroom wall. The second floor walkway wings out at angles to provide physical and visual space. Diners enjoy tacos and homemade ice cream at Victory Taco. 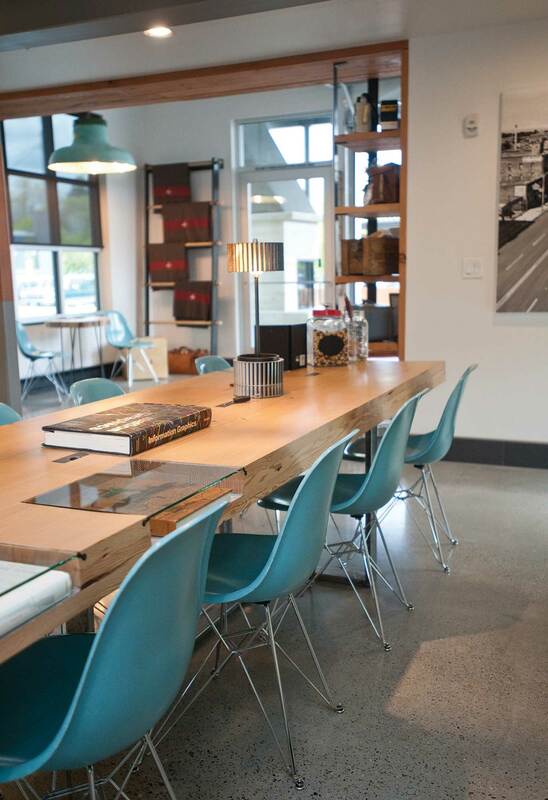 Guests can sit in reproduction Eames chairs in the lobby’s map room and browse a collection of USGS maps as knowledgeable staff suggest places to ski, bike, hike, and drink locally brewed beer. Designer Seth Nelson’s infographic gives a nod to Bozeman’s fishing culture by depicting each species’ record size and illustrating the fish in the context of one another.